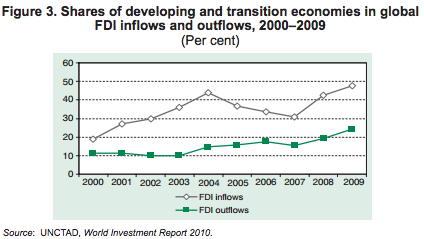 Global foreign direct investment (FDI) flows began to bottom out in the latter half of 2009. This was followed by a modest recovery in the first half of 2010, sparking some cautious optimism for FDI prospects in the short term (fig. 1). In the longer term, the recovery in FDI flows is set to gather momentum (fig. 2). Global inflows are expected to pick up to over $1.2 trillion in 2010, rise further to $1.3–1.5 trillion in 2011, and head towards $1.6–2 trillion in 2012. However, these FDI prospects are fraught with risks and uncertainties, including the fragility of the global economic recovery. The current FDI recovery is taking place in the wake of a drastic decline in FDI flows worldwide in 2009. After a 16 per cent decline in 2008, global FDI inflows fell a further 37 per cent to $1,114 billion, while outflows fell some 43 per cent to $1,101 billion. There are some major changes in global FDI patterns that preceded the global crisis and that will most likely gain momentum in the short and medium term. Firstly, the relative weight of developing and transition economies as both destinations and sources of global FDI is expected to keep increasing. 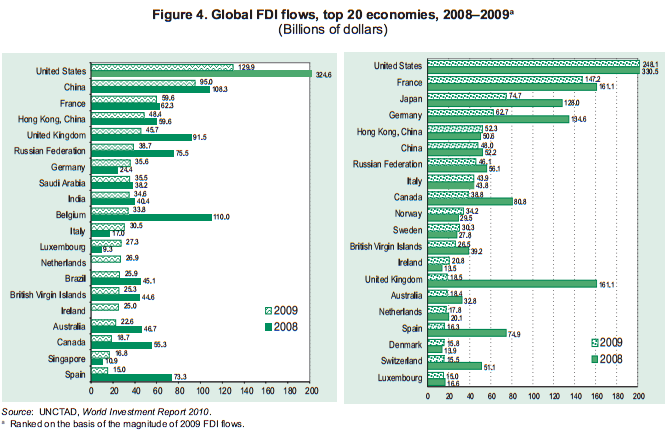 These economies, which absorbed almost half of FDI inflows in 2009, are leading the FDI recovery. Secondly, the recent further decline in manufacturing FDI, relative to that in the services and primary sectors, is unlikely to be reversed. Thirdly, in spite of its serious impact on FDI, the crisis has not halted the growing internationalization of production. All the components of FDI flows – equity investment, intra-company loans and reinvested earnings – contracted in 2009. Depressed levels of cross-border merger and acquisition (M&A) transactions, as well as the lower profits of foreign affiliates, had a heavy effect on equity investments and reinvested earnings. Improved corporate profits have, however, supported a modest recovery in reinvested earnings since the second half of 2009. 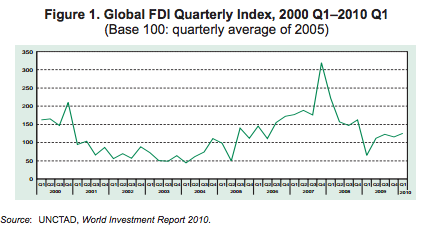 FDI showed renewed dynamism in the first quarter of 2010. Cross-border M&As – still low at $250 billion in 2009 – rose by 36 per cent in the first five months of 2010 compared to the same period in the previous year. The slump in cross-border M&As accounts for most of the FDI decline in 2009. Acquisitions abroad contracted by 34 per cent (65 per cent in value), as compared to a 15 per cent retrenchment in the number of greenfield FDI projects. M&As are usually more sensitive to financial conditions than greenfield projects. This is because turmoil in stock markets obscures the price signals upon which M&As rely, and because the investment cycles of M&As are usually shorter than those of greenfield investments. The global crisis curtailed the funding available for FDI, reducing the number of acquisitions. While depressed stock prices reduced the value of transactions, together with global restructuring they also created opportunities for the TNCs that were still able to access finance. Although FDI flows through both entry modes are showing signs of recovery in 2010, M&As are rebounding faster. FDI declined across all three sectors – the primary, manufacturing and services sectors. Cyclical industries such as the automotive and chemical industries were not the only victims. FDI in industries that were initially resilient to the crisis – including pharmaceuticals and food processing – was also hit in 2009. Only a handful of industries attracted more FDI in 2009 than in 2008, namely electricity, gas and water distribution, as well as electronic equipment, construction and telecommunications. In all, FDI in the manufacturing sector was the worst affected, reflected in a decline of 77 per cent in cross-border M&As compared to 2008. The contraction in such transactions in the primary and services sectors was less severe – at 47 per cent and 57 per cent respectively. This continued to push up their relative weights in global cross-border M&As at the expense of manufacturing. Yet some industries in these sectors were severely affected too: notably, the value of cross-border M&A transactions in financial services collapsed by 87 per cent. FDI by private equity funds decreased by 65 per cent in terms of value, while FDI from sovereign wealth funds (SWFs) rose by 15 per cent in 2009. These funds together accounted for over one tenth of global FDI flows, up from less than 7 per cent in 2000 but down from 22 per cent in the peak year of 2007. FDI by private equity funds was affected both by the drop in their fundraising and by the collapse of the leveraged buyout market. The value of cross-border M&As by private equity funds went down to $106 billion in 2009, or less than a quarter of its 2007 peak value. Nevertheless, smaller transactions exhibited resilience, and the number of acquisitions involving private equity funds actually increased. Private equity activity is showing signs of recovery in 2010, but proposed regulation in the European Union (EU) may restrict future transactions. Funding for SWFs also suffered in 2009, due to declines in commodity prices and trade surpluses. Yet their FDI activity did not decline, reflecting the relatively high growth of the emerging economies that own these funds. New investments were redirected towards the primary sector and industries less vulnerable to financial developments as well as developing regions. Despite its impact on FDI flows, the global crisis has not halted the growing internationalization of production. The reduction in sales and in the value-added of foreign affiliates of transnational corporations (TNCs) in 2008 and 2009 was more limited than the contraction of the world economy. As a result, foreign affiliates’ share in global gross domestic product (GDP) reached an historic high of 11 per cent (table 1). TNCs’ foreign employment increased slightly in 2009, to 80 million workers. The rise of developing and transition economies is apparent in international production patterns. These economies now host the majority of foreign affiliates’ labour force. In addition, they accounted for 28 per cent of the 82,000 TNCs worldwide in 2008, two percentage points higher than in 2006. This compares to a share of less than 10 per cent in 1992, and reflects their growing importance as home countries as well. Foreign affiliates’ assets grew 7.5 per cent in 2009, thanks largely to the 15 per cent rise in inward FDI stock to $18 trillion. The increase in FDI stock was due to a significant rebound of global stock markets as well as continued investment inflows of FDI, which remained positive but expanded at a much reduced pace than before. FDI inflows to developing and transition economies declined by 27 per cent to $548 billion in 2009 (table 2), following six years of uninterrupted growth. While their FDI contracted, this grouping appeared more resilient to the crisis than developed countries, as their decline was smaller than that for developed countries (44 per cent) (table 2). Their share in global FDI inflows kept rising: for the first time ever, developing and transition economies are now absorbing half of global FDI inflows (fig. 3). Following a five-year upward trend, FDI outflows from developing and transition economies contracted by 21 per cent in 2009. However, with the rise of TNCs from those economies, the FDI contraction was also more muted than in developed countries, where FDI outflows shrank by 48 per cent (table 2). 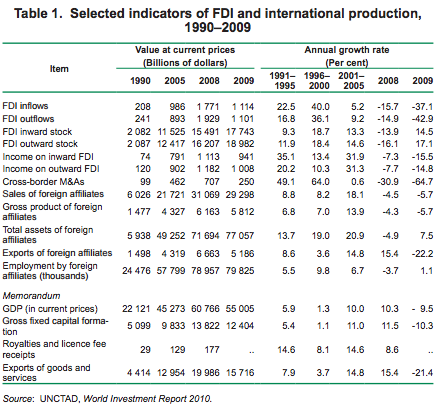 FDI is also rebounding faster in the developing world. The share of their outward investment remains much smaller, but it is accelerating and reaching a quarter of global outflows (fig. 3). Among the largest FDI recipients, China rose to second place after the United States in 2009. Half of the six top destinations for FDI flows are now developing or transition economies (fig. 4). Over two thirds of cross-border M&A transactions still involve developed countries, but the share of developing and transition economies as hosts to those transactions has risen from 26 per cent in 2007 to 31 per cent in 2009. In addition, this grouping attracted more than 50 per cent of greenfield projects in 2009. On the outward investment side, Hong Kong (China), China and the Russian Federation, in that order, are among the top 20 investors in the world (fig. 4). As highlighted by some of the data presented above, the global picture of FDI flows belies a more varied regional reality. Most FDI in developing and transition economies has flowed to a small number of countries, mainly large emerging markets. Following almost a decade of uninterrupted growth, FDI flows to Africa fell to $59 billion – a 19 per cent decline compared to 2008 (table 2) – mainly due to contraction in global demand and falling commodity prices. Commodities producers in West and East Africa were affected. Flows to North Africa also declined despite its more diversified FDI and sustained privatization programmes. Contraction of investment in the services sector in Africa was less pronounced than in other sectors. Sustained by expanded activity, the telecommunications industry became the largest recipient of FDI inflows. Recovering commodity prices and continued interest from emerging Asian economies are expected to feed a slow upturn in FDI flows to Africa in 2010. TNCs from developing and transition economies have increasingly been investing in Africa over the past few years. They accounted for 22 per cent of flows to the region over the 2005–2008 period, compared to 18 per cent in 1995–1999. Investors from China, Malaysia, India and the Gulf Cooperation Council (GCC) are among the most active – although Africa still makes up only a fraction of their FDI. Investors from Southern Africa and North Africa have also raised their profile in the region. These new sources of investment not only provide additional development opportunities, but are also expected to be more resilient than traditional ones, providing a potential buffer against crises. Outward investment from Africa as a whole contracted by half, to $5 billion. Outflows from Southern Africa, however, expanded to $1.6 billion in 2009, boosted by South African investment, mainly in the rest of Africa. Nevertheless, North Africa remained the largest source of regional outflows, accounting for over 50 per cent of the total. FDI flows to South, East and South-East Asia have experienced their largest decline since 2001, but they are the first to bottom out from the current downturn. Inflows to the region dropped by 17 per cent in 2009, to $233 billion (table 2), mainly reflecting a decline in cross-border M&As, which was particularly severe in services (-51 per cent). As investment from developed countries plummeted, intraregional FDI gained ground and now accounts for as much as half of the region’s inward FDI stock. Total outflows from the region declined by 8 per cent to $153 billion, with cross-border M&A purchases dropping by 44 per cent. Against these trends China’s outward investment in the non-financial sector continued to expand, driven by a continued search for mineral resources and for the M&A opportunities created by global industrial restructuring. FDI in South, East and South-East Asia has already started rebounding, and is likely to pick up speed as the region plays a leading role in the global economic recovery. In particular, inflows to China and India started picking up as early as mid-2009, and their sustained FDI outflows are expected to drive the region’s outward investment back to growth in 2010. Recovery of FDI in and from the four newly industrializing economies (Hong Kong (China), Republic of Korea, Singapore and Taiwan Province of China), however, is likely to be slow and modest. Growing intraregional investment in Asia has served as a vehicle for technology diffusion, “recycling” of comparative advantages and competitiveness enhancement. It has been instrumental in the sequential upgrading of industries across countries at various stages of development. Regional integration and China’s take-off are now accelerating this process, creating development opportunities for a wider range of countries, including LDCs such as Cambodia, the Lao People’s Democratic Republic and Myanmar. In addition, this process of sequential upgrading has expanded beyond industries such as electronics, and more high-tech products have been involved. The tightening of international credit markets and the decline of international trade impacted FDI flows to West Asia, which contracted by 24 per cent to $68 billion in 2009 (table 2). Except in the case of Kuwait, Lebanon and Qatar, inward FDI declined across the region. The contraction hit Turkey and the United Arab Emirates the hardest. In Turkey, cross-border M&As plummeted, and export-oriented industries suffered from the impact of the global crisis. FDI outflows from the region, 87 per cent of which are generated from the countries of the GCC, declined by 39 per cent to $23 billion. Rising outward investment from Saudi Arabia was not enough to compensate for the negative impact of the Dubai World crisis. Provided that this crisis abates and international credit markets stabilize, West Asian Governments’ sustained commitment to ambitious infrastructure plans is expected to support a recovery in FDI inflows in 2010. Outward investment, on the other hand, will remain subdued in the short term. State-owned entities – the region’s main investors – have refocused their attention on their domestic economies, and the Dubai World crisis will continue to weigh on the outward FDI of the United Arab Emirates. The impact of the global economic and financial turmoil drove FDI to Latin America and the Caribbean down to $117 billion – a 36 per cent decline from the 2008 level (table 2). Although Brazil, with a 42 per cent contraction in inward investment, was more affected than the region as a whole, it remained the largest FDI recipient. Cross-border M&As in the region collapsed, turning negative in 2009 due to sales of foreign affiliates to domestic companies, particularly in Brazil. FDI inflows are expected to recover in 2010 and to continue growing in the medium term, as Brazil and Mexico remain popular investment destinations, according to investor surveys. Brazil’s outward FDI swung to a negative $10 billion, due to a surge in intra-company loans from Brazilian affiliates abroad to their parent companies. This resulted in a 42 per cent decline in the region’s outward investment. Nevertheless, cross-border M&A purchases by TNCs from the region, directed mainly at developed countries, rose by 52 per cent to $3.7 billion. The continued emergence of the region’s TNCs, which began in 2003, will drive outward FDI in the medium term. FDI outflows from Latin America and the Caribbean leaped from an average of $15 billion a year in 1991–2000 to $48 billion annually in 2003–2009. An increasing number of Latin American companies – mostly Brazilian and Mexican – have been expanding outside the region, primarily into developed economies. Besides favourable economic conditions in the region since 2003, government policies also contributed to the consolidation of domestic firms at home and their further outward expansion. The region’s main foreign investors today are often the largest and oldest business groups that prospered during the import substitution era. Moreover, privatization policies in countries such as Brazil and Mexico have resulted in the creation of national champions. More recently, government incentives in Brazil, including targeted credit lines, have supported companies’ outward expansion. Limited access to domestic financing, coupled with the current tight international financial markets, could hinder further expansion, however. These TNCs will continue to benefit from their low debt-to-earnings ratio, limited exposure to the industries most affected by the crisis, and the relative resilience of the region’s economy. After an eight-year upward trend, FDI inflows to South-East Europe and the Commonwealth of Independent States (CIS) shrank to $69.9 billion, a 43 per cent decline from 2008 (table 2). FDI inflows to both subregions dropped in 2009, although flows to South-East Europe were less affected than those to the CIS. FDI flows to the Russian Federation almost halved, due to sluggish local demand, declining expected returns in projects related to natural resources, and the drying-up of round-tripping FDI. Nevertheless, the Russian Federation ranked sixth in the global ranking of top locations in 2009. Cross-border M&As collapsed due to sluggish acquisitions by firms from the EU, the largest investors in the region. Investments from developing countries, China in particular, were on the rise, though. The contraction of FDI outflows from the region (-16 per cent) was not as severe as the decline in inflows. In 2009, the Russian Federation – by far the largest source of outward FDI from the region – became a net outward investor. Stronger commodity prices, a new round of privatization, and economic recovery in large commodity-exporting countries (Kazakhstan, the Russian Federation and Ukraine) should support a modest recovery in FDI in the region in 2010. FDI in South-East Europe’s banking industry has been on the rise since the early years of the new millennium, fuelled by substantial restructuring and privatization. As a result, 90 per cent of banking assets were owned by foreign entities at the end of 2008. Foreign banks have played a positive role in the region during the global financial crisis. The recent sovereign debt crisis in Greece, however, is reviving concerns that the large presence of foreign banks could channel systemic risks to the region. FDI flows to developed countries suffered the worst decline of all regions, contracting by 44 per cent to $566 billion (table 2). However, this setback was not as pronounced as during the previous economic downturn of 2000–2003, even though the current economic and financial turmoil is far more severe. North America was the worst affected, while the 27 member countries of the EU weathered the blow better with Germany, for example, recording a 46 per cent increase, mainly due to an upswing in intra-company loans. On the other hand, FDI flows to the United Kingdom, another major host country in the region, shrank by 50 per cent compared to the previous year. Cross-border M&As dropped by two thirds in developed countries, with transactions in the manufacturing sector contracting by about 80 per cent. A modest economic recovery stabilized inward investment in the first half of 2010 and is expected to push FDI inflows to developed countries to above their 2009 levels. Ongoing liberalization in areas such as electricity, further regional integration, and continued interest from TNCs based in developing and transition economies should all contribute to better FDI prospects for the developed countries in the medium term. Outward FDI, after falling 48 per cent in 2009, is also expected to recover in 2010 and pick up pace in the medium term, supported by the improving global economic prospects, in particular in the developing world. However, the perception of increased risk of sovereign debt default in certain European countries and its possible further spread in the eurozone could easily disrupt this upward trend. The economic downturn has revived long-standing concerns in developed countries over the impact of the growing internationalization of production on home country employment. Rapid growth of outward FDI over the past decade has resulted in a growing share of developed-country TNCs’ employment moving abroad. And yet, FDI can save or expand domestic employment if it results in exports for the home country or improved competitiveness for investing firms. Research has produced mixed evidence on the impact of outward FDI on domestic job reduction. Indeed, the impact depends on the type of investment, the location of affiliates and TNCs’ employment strategies. The decline in FDI to weak, vulnerable and small country groupings – LDCs, LLDCs and SIDS – is of particular concern given its role in these countries’ economies. The level of FDI compared to their gross fixed capital formation was equivalent to between 25 per cent and 40 per cent in 2009 across these groupings, which was much higher than in other parts of the world. While FDI is concentrated in natural resources in terms of value in these groups, FDI is diversified in manufacturing and services sectors as well judging by the number of such projects. Their share in global FDI inflows was only 4 per cent (table 2). 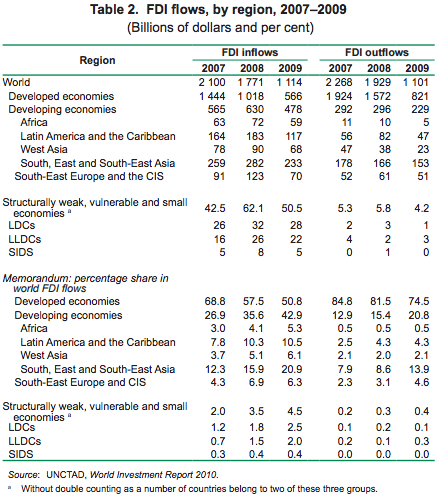 FDI flows to the 49 least developed countries (LDCs) declined by 14 per cent to $28 billion. The impact of lower inward investment is particularly serious for this group of countries, as the high ratio of FDI to their gross fixed capital formation (24 per cent in 2009) suggests that it is a major contributor to capital formation. FDI inflows to LDCs still account for only 3 per cent of global FDI inflows and 6 per cent of flows to the developing world. FDI remains concentrated in a few countries that are rich in natural resources. Greenfield investments account for the bulk of FDI in LDCs, and over 60 per cent of such projects originated from developing and transition economies in 2009. Most FDI inflows to the group still originate from developed countries. FDI prospects over the medium term depend on the extent to which LDCs’ structural weaknesses are overcome. These disadvantages could be partly mitigated if official development assistance (ODA) were to be used more effectively, with a view to boosting the productive capacity of the host country in order to leverage FDI for development. The 31 landlocked developing countries (LLDCs) have not traditionally been seen as attractive FDI destinations. Inherent geographical disadvantages compounded by structural weaknesses have hampered their economic performance. And yet economic reforms, investment liberalization and favourable global economic conditions had translated into a steady increase in FDI inflows during 2000–2008. The 17 per cent decline in FDI to $22 billion in 2009 was less pronounced than in the rest of the world. Due to the lack of diversification of productive capacities, FDI to LLDCs remained concentrated in the primary sector of a few resource-rich countries (Kazakhstan alone received 58 per cent of the total in 2009). FDI to LLDCs, which originates primarily from developing economies, especially from Asia and Africa, is expected to pick up only slowly. In order to overcome their geographical challenges, LLDCs could focus on industries that have a higher knowledge and information content and that are less reliant on the use of inputs involving transportation costs. Regional integration involving non-landlocked countries could also make these economies more attractive investment destinations, by expanding the size of local markets. The 29 small island developing States (SIDS) have also struggled to attract FDI. The small size of their domestic markets, limited natural and human resources, and high transaction costs such as those for transport, have discouraged FDI. However, in spite of its 35 per cent decline to $5 billion in 2009, the ratio of FDI flows to gross fixed capital formation remained above 30 per cent, as domestic investment contracted even more. Half of the grouping’s total FDI inflows were concentrated in the top three SIDS investment destinations (Jamaica, Trinidad and Tobago, and the Bahamas, in that order). Tax-haven SIDS accounted for about one quarter of both FDI inflows and stocks in 2009, but stricter international regulations are gradually eroding inward FDI to those economies. Given their geographical limitations, SIDS are expected to continue to rely on their potential in traditional niche services such as tourism. Knowledge-based industries also offer promising potential, provided that SIDS develop adequate information technology and telecommunications infrastructure and improve their human capital. UNCTAD estimates that global FDI flows will slightly recover to reach over $1.2 trillion in 2010, before picking up further to $1.3–1.5 trillion in 2011. 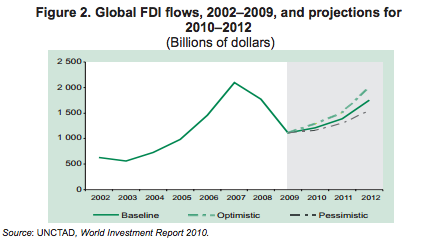 Only in 2012 is FDI expected to regain its pre-crisis level, with a range estimated at $1.6–2 trillion. The gradual improvement of macroeconomic conditions, corporate profits and stock market valuations observed in early 2010 is expected to continue, supporting renewed business confidence. After a contraction of 2 per cent in 2009, the global economy is projected to grow by 3 per cent in 2010. Both interest rates and commodity prices will most likely remain moderate until the end of the year, helping to keep production costs under control and supporting domestic investment. Corporate profits have been recovering since mid-2009 and are expected to pick up in 2010. Together with better stock market performance, this will support financing for FDI. UNCTAD’s World Investment Prospects Survey 2010–2012 indicates renewed business optimism over the medium term. TNCs’ intentions to pursue foreign expansion are stronger for 2011 and 2012. The recovery of FDI is likely to be led by cross-border M&As. Restructuring in a number of industries, as well as the privatization of companies rescued during the global turmoil, will further create cross-border M&A opportunities for TNCs. The survey also confirms that the share of the manufacturing sector in FDI will continue to decline relative to the primary and services sectors. TNCs from developing economies are more optimistic than their counterparts from developed countries, and expect that their foreign investments will recover faster. This suggests a continued expansion of emerging TNCs as a source of FDI. In addition, global investors show an ever-growing interest in developing economies. Brazil, the Russian Federation, India and China (BRIC), in particular, are bright spots for FDI. Flows to developing and transition economies will not only be directed at the most labour-intensive parts of the value chain, but increasingly at more technology-intensive activities. The global financial and economic recovery remains fragile, threatened by emerging risks, constraints in public investment, uncertainty about financial regulatory reforms, the limited access to credit, the volatility of the stock and foreign exchange markets and other factors. For the recovery to remain on track, private investment is crucial for stimulating growth and employment. FDI has a major role to play. At present, cautious optimism prevails regarding prospects for global FDI.